Tracy Chapman’s another artist whose career I’m too young to have witnessed in person: her first album was released the year after I was born, while the last one I heard of, Telling Stories, came out right when I was starting to despise commercial pop and engage with my first love, punk-rock. 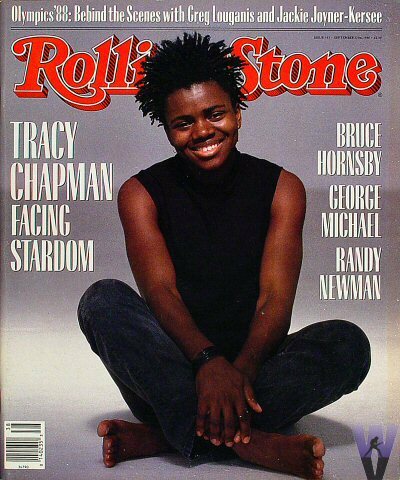 I found out about Tracy Chapman’s most known singles much after they were released, thanks to the afternoon radio programmes that my parents used as background noise at home. Bless the radio, yeah – I don’t listen to it much these days, but it saved me from death by boredom lots of times when I was a kid. Tracy Chapman, Tracy Chapman. Despite her name, I thought for quite a long time that she was a actually man. I don’t mean to be offensive, here; on the contrary, my mistaken impression was due to the depth and power of her voice, which I absolutely admire. And to the fact that back in the day I barely saw her face, and first got to know of her through her music and voice alone. Plus, her hair’s quite short on the cover of the first album, isn’t it? Well, nevermind. What really matters is her music, and who cares if she has a deep voice, if it conveys intense emotions and tells meaningful tales? I surely don’t. Let’s take Fast Car, for example. Fast Car sounds a little bit like every girl’s story – or, in a way, a story every girl would like to tell. Drunk father, dreary life, unhappiness everywhere…until, suddenly, someone truly beautiful saves it all and provides a means of escaping to a brand new life. Again, no offense, no sarcasm: I love that song. I have found myself a million times dreaming of the Right Guy with a Fast Car, and every time I thought I’d met someone who could fit the description I hopelessly daydreamed about finally finding out how nice his arm felt around my shoulder. Or where we could run away to, what would our tiny and cheap apartment look like, how long it would have taken us to finally settle down – together. Yes, I was that kind of daydreamer, when I was younger. Hopeless, did I already mention that? Just like the girl in the song, I guess. And a million other girls out there. Tracy’s deep, moving voice sings the story of all of us, with the words we’d use ourselves to tell it. And that’s why Fast Car is precious – as much as Baby Can I Hold You, for that matter, or any of her other songs. They possess the right balance between intimate feelings and universal meanings, they show us both life as it is and as we would like it to be. And that’s what makes them worth to be listened to again, and again, and again. Great article Adenike, you have a nice style of writing. Tracy Chapman was indeed good in her time. She didn't do much after this unfortunately.